It's advantage Wolfsburg ahead of the second leg of the Bundesliga relegation play-off, but Eintracht Braunschweig have promised their Lower Saxony neighbours a raucous reception at the Eintracht-Stadion on Monday night (kick-off 20:30CEST/18:30GMT). Read: Wolfsburg and Braunschweig: Close neighbours, unfamiliar foes. Wolfsburg's 20-year Bundesliga status hangs in the balance as they travel to local rivals Braunschweig on Monday, holding a 1-0 lead from the first leg at the Volkswagen Arena. Star man Mario Gomez made the difference as he converted a first-half penalty in Thursday's opening act, and Wolves sporting director Olaf Rebbe now wants his team to build on their slender advantage and live up to their billing as favourites. "We're happy to be labelled as favourites," Rebbe admitted in a press conference on Sunday. "We are the top-flight side and Braunschweig are the challengers. We know what our team is capable of and we're optimistic about our chances." Head coach Andries Jonker had a more measured perspective. "It'll be a tough match," the 54-year-old said. "But we were the better team in the first leg and won the game, and we'll try to do the same again tomorrow." Wolfsburg have spent the last two days training in the small town of Marienfeld in East Westphalia, having already travelled to Dutch town De Lutte for a mini training camp ahead of the first leg. "We had some very positive experiences in De Lutte, and decided that we should prepare for the return leg away from Wolfsburg too," Jonker explained. "The conditions in Marienfeld were exceptional. We were able to cut ourselves off and work and prepare for this match in peace." Jonker is hoping to recover defensive midfielder Josuha Guilavogui after he was forced off in the first leg with a minor thigh complaint, but Paul-Georges Ntep and Ricardo Rodriguez will both miss out on Monday night, joining Sebastian Jung, Riechedly Bazoer and Jakub Blaszczykowski on the sidelines. "Ricardo tried everything to be able to play, but he won't be in the squad," Jonkies regretted. "We'll have to wait until Monday to see if Josuha can feature." Braunschweig, meanwhile, have made no particular changes to their habits and will sleep at the usual hotel on Sunday ahead of their biggest game of the season. One of only 16 teams to form the original Bundesliga line-up in 1963, the Lions are seeking just their second promotion to the top flight since 1985. "It's our chance to achieve something historic," said coach Torsten Lieberknecht. "We really want to put in a good performance. We earned our spot in this play-off and now we have to show that we are worthy of promotion." Lieberknecht also promised neighbours Wolfsburg a fitting reception as they make the short but unfamiliar journey of just 35 kilometres to the Eintracht-Stadion. "The stadium will be on fire," he grinned. "It's not very pleasant coming to play us on a Monday night." Braunschweig will have to do without top scorer Dominick Kumbela and forward Julius Biada, but Lieberknecht insisted his troops would still be ready for another dance with the Wolves. "We're tense and relaxed in equal measure," he confided. "But I've made sure the lads are fired up for the game. We got the blood pumping in training today, and we're determined and confident that we can achieve our goal." Wolfsburg certainly won't be underestimating Braunschweig, after picking up just a point against their newly-promoted rivals in the 2013/14 Bundesliga season. But they also have absolutely no intention of relinquishing their place at German football's top table. "We owe it to our fans to give our all and leave the pitch as winners," Rebbe concluded. "Footballing quality will not be the main issue on Monday. All that counts is the result and the win, regardless of how we achieve it." One region, two clubs, one Bundesliga spot up for grabs. It's not to be missed. 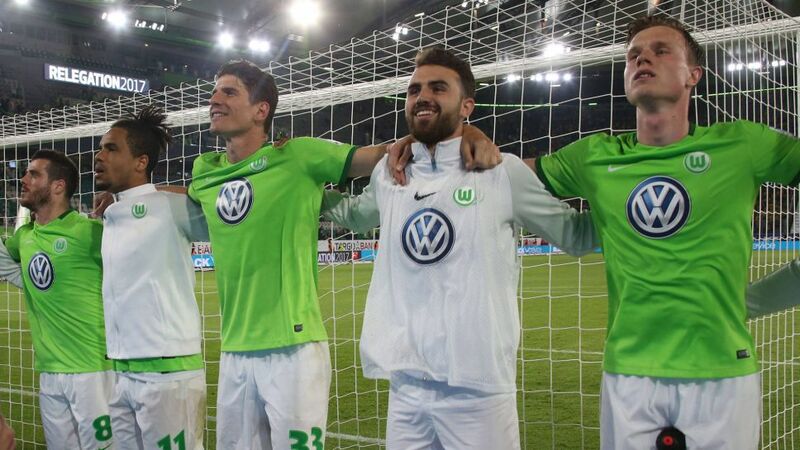 Click here for all the latest Wolfsburg team news!